A year ago today I woke up to the news that my dear friend Jim Rygelski no longer was with us. Since then, there have been many times I’ve missed his advice, friendship and the banter in the many breakfasts we shared. I’m not sure how the Cardinals got through this season without him, or the folks at St. Ambrose on the Hill. All of his many friends could say the same. In the 23 years I knew him, Jim was a close friend and a terrific boss. He knew his baseball and showed it in two well-received baseball books he co-authored. He always bemoaned what was going on in the sport, but never stopped heading out to Busch Stadium and cheering for the Cardinals. 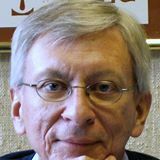 He exemplified the kind of journalism practiced at the old Globe-Democrat, where he worked before it closed. At the Suburban Journals in the 1990s, he was the model of a community journalist. The most faithful Catholic you could imagine, he was the first lay editor of the St. Louis Review. He was a staunch conservative Catholic, as he was a strict political conservative. I’ll say it. He was Old School about everything. Toward the end, he expressed his views in an occasional column on religion in the Post-Dispatch. As an evangelical, I sometimes shared my differences with him. But I knew he was devoted not only to the church, but to Jesus. Jim proofread the first half of my book The Making of an Icon: The Dreamers, The Schemers, and the Hard Hats Who Built the Gateway Arch and predicted great things for it. I dedicated the book to him after he died. 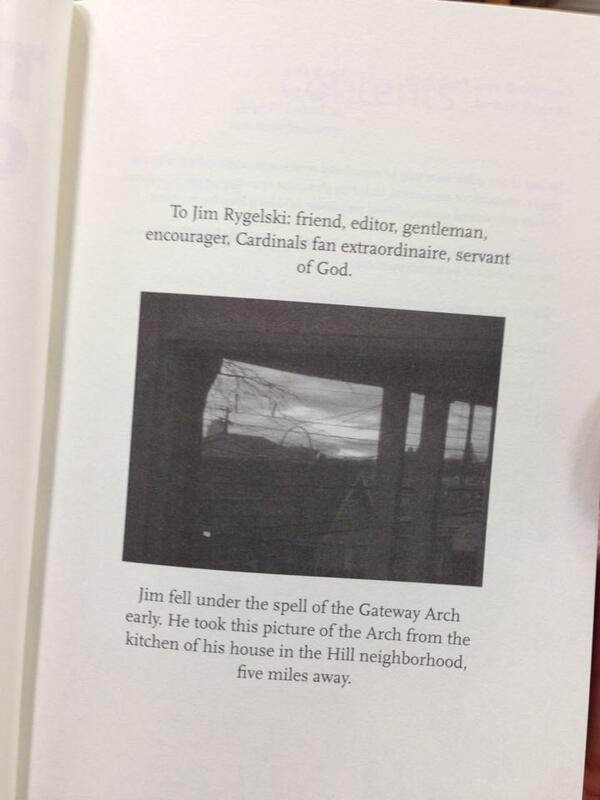 With that dedication is a picture he took of the Arch from the back window of his house on The Hill. Jim is a perfect example of the adage that we don’t know what we have until it’s gone. I don’t think I’ll ever stop missing him. Hi, Jim–That is a lovely remembrance of another Jim. Mr. Rygelski and I got to be great friends when we worked together at the Galesburg Register-Mail right out of college in the late 1970s (and we were fired together!) 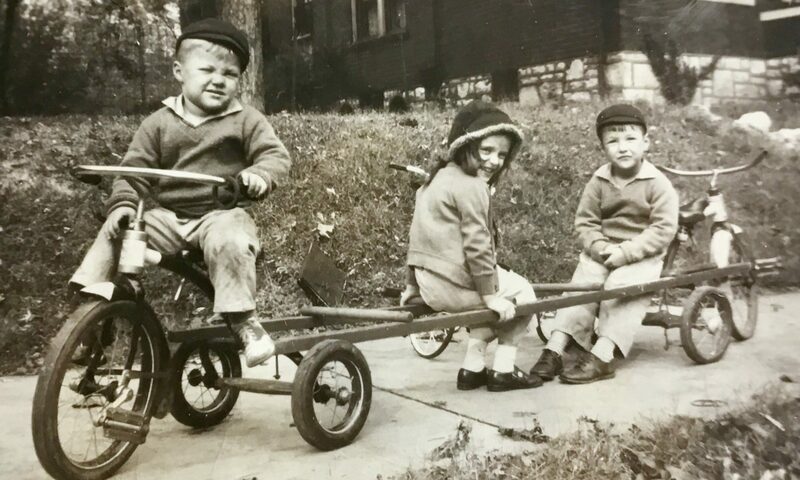 We stayed in touch over the years, despite the geographical distance between us–after he returned to St. Louis, I moved on to the Quad Cities, then Chicago, then Los Angeles, where I live now.`We eventually came to have a distance in viewpoints too–when we first met he was a lapsed Catholic and politically liberal. I could tell he became more conservative after he returned to his faith, but I generally didn’t engage him on politics (I have always been liberal and just keep getting more so) because I didn’t want to start a fight. Even though I am generally very outspoken, I didn’t want to jeopardize the friendship. But I should have had faith it was strong enough to endure those disagreements. Jim was a wonderful man, and I wish I could call him up today. So do I, Trudy. There isn’t a week that goes by that I don’t think about going out and having breakfast with him. Jim. That is a wonderful look back on A Year Without Jim Rygelski. I remember him well from my early days as a sports stringer with the West and South County Journals back in early 1990’s. He was a wonderful presence in the newsroom who was a great editor, journalist, and educator of our craft. I always left the newsroom feeling better and smarter after spending some time with him talking about what was going on with our work or the area in general. Thanks for sharing!! !